Mix flour with water. We found 2 cups of water and 2 cups of flour was a perfect amount to give you 6 colors. You can use more or less. This was enough for my 2 older girls. Spray a baking sheet with cooking spray. 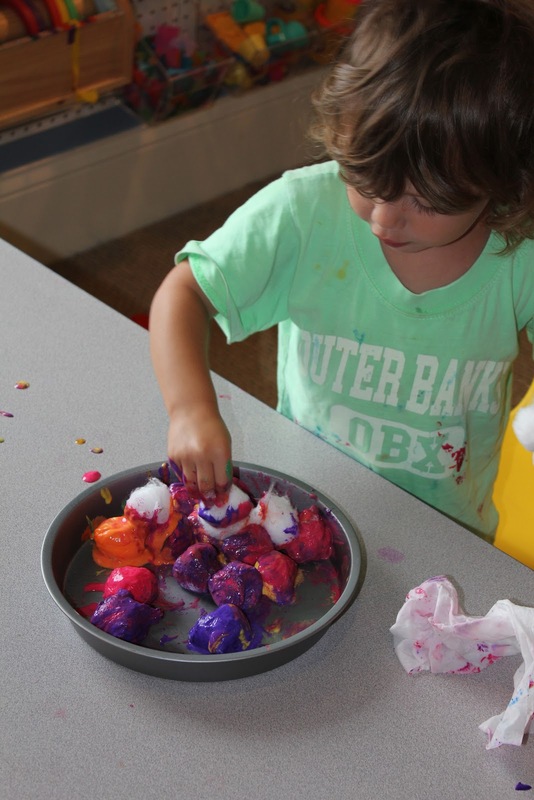 Dip your cotton balls into the mixture and make your design. Bake at 300 degrees for 45min to 1 hour. If you place the cotton balls next to each other they will stick together while baking. I told the girls to cover their cotton balls completely with the mixture. I'm not so sure how dry cotton would do in an oven! My oldest starting on her design. We used a round cake pan for these. She liked cleaning her hands with the cotton balls. They used one color up at a time to the very last drop. "I'm making an apple pie. What are you making? There were a few cotton balls that my 29M didn't quite cover completely. I did double dip them for her. My 3.5 year old's "Apple pie". They do get pretty hard, however, you can still break them open and pull out the cotton from inside. Pretty cool. The possibilities for these are endless. You can do designs, patterns, letters, numbers, animals, etc. You can also draw on them after they are cooked. It's pretty much a cotton ball paper mache. I wonder if this could be done with a gluten free flour or cornstarch. My son would love this. This seems like soo much fun! Using a hammer to smash them would be so much fun! Can't wait to try it. I love this, going to scrounge around and see if I have everything needed. This is something different. Think I am going to try it with my daughter. Looks fun. Hi there! Thank you! And... Where have you gotten liquid water colors? I've have never found... Except a vintage set at a garage sale. Thanks you in advance! Okay, I have a silly question. I have been reading your blog for awhile and I have seen this white divided dish that you have for many of the activities. What is it? Is it like a chip and dip tray or something? I love it and it seems so perfect for so many of these activities and I wanted to get one for myself. Thanks so much for sharing all of your ideas! Elizabeth - it's a sorting tray. you can get them through different teacher/parent stores such as lakeshore or beckers. but i just get them at the dollar store - much cheaper that way. the trays i get are meant as chip & dip trays, like you mentioned, but work great for sorting. That is a fun idea. We will have to try that when our four 21 month-old toddlers get bigger. Please link this to Artsy Play Wednesday on Capri + 3 (along with any other arts, crafts and play posts). Goo Gone from the dollar store is pretty awesome for removing stickyness. It works great on stickers, gum, and even Christmas tree sap. I know you said use either food coloring or liquid watercolors, but can you tell me what you used to get these super bright colors? I can't seem to get mine this bright. Also, what you used to get your pasta so bright in that post? Using this today! Making it into an Easter activity by using oval shaped pans to make "eggs" out of "bunny tails!" My 4 year old is loving it!! !